The Comanche language is an Uto-Aztecan dialect that is very similar to what is spoken by the Shoshone Indians. It is believed that these two tribes once occupied the area we now call Wyoming. In the early 1600's, the Comanche began migrating along the eastern side of the Rocky Mountains. They settled as far south as northern Mexico. Historians tell us that the Comanche were first introduced to horses in the late 1600's, and they were amazing on horseback. The Comanche acquired horses by raiding white settlers ranches. In addition, they tracked and tamed wild mustangs. The Comanche were also skilled horse breeders who were known to maintain large herds. Children were given their first horses by age five. Their horses responded to both touch and voice commands. Horses allowed them to travel great distances in search of buffalo. The Comanche lived in buffalo hide tepees, wore buffalo clothes, and they ate buffalo. It is believed that the Comanche killed more white settlers than any other tribe of its size. They sometimes rode more than 200 miles to attack a Spanish settlement. Comanche influence prevented the Spanish from developing the region now known as Texas. Both Anglo-American and Mexican settlers died at the hands of the Comanche as they traveled the Santa Fe Trail between Missouri and New Mexico During the 1830's the Comanches repeatedly defeated the Texas Rangers. Eventually, the Texas Rangers armed themselves with Colt six-shooters. At this time they began to hold their own against the Comanche. Then in 1849-50 a cholera epidemic broke out and the Native Americans had little resistance against its effects. The disease exacted a heavy toll on the Comanche people, but it didn't stop them. They would repel the white invasion for another twenty years. 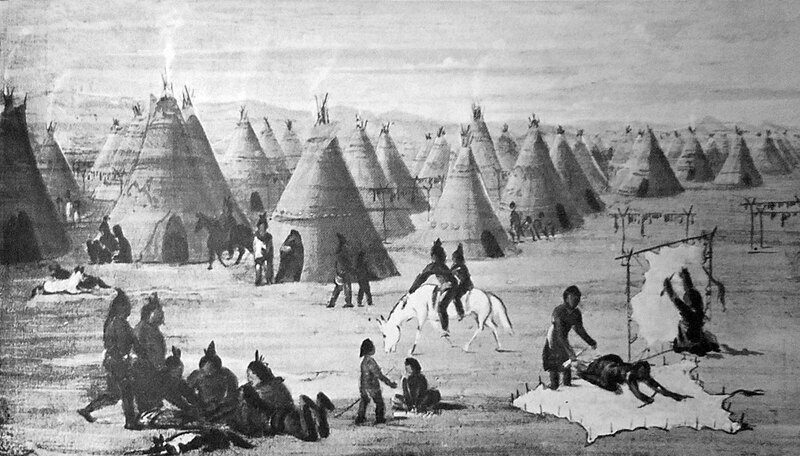 The last Comanche uprisings occurred in the 1870's. At this time they were led by an amazing chief named Quanah Parker. Quanah's mother was white, and she had been kidnapped at age nine by Indians. She adapted to the Comanche ways, and as a teenage she wed Comanche Chief Peta Nocona. Quanah began to hate whites when his brother died of a white disease, and his father was killed by whites. To make things worse his mother was captured and returned to the white world where she died shortly afterward. Quanah let his presence be known to the U.S. Calvary when he twice led charges against its forces. One time he rode right through the army fort at Rock Station. There he stampeded and captured many of their horses. In June 1874, Quanah fought against buffalo hunters at Adobe Walls. This was called the Red River War, and the Indians were defeated by repeater rifles. A short time later, General Sherman launched a massive campaign to defeat Quanah and the Comanches. Finally, after a series of skirmishes, the Comanches were crushed at their stronghold of Palo Duro Canyon. Quanah Parker and his warriors turned themselves in June 1875.